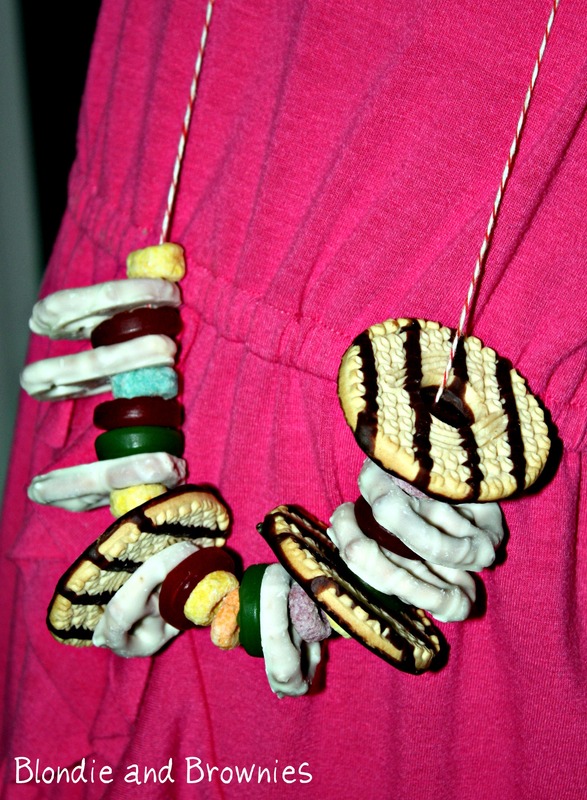 This edible necklace is my take on the candy necklaces that we all enjoyed in the 70s, 80s, and 90s – are they still around??? Anyway, I never did like the candies that were on them and there are so many options (cereal, candies, cookies, etc) available nowadays – so there’s no excuse not to string your own (or have your kids do it)! In fact, stringing these necklaces is a great activity to do at a party, or if you’re homeschooling you could use this to practice patterns and counting. Plus it’s edible, so that alone makes it a winner in my book! You can even customize these to make them appropriate for even your youngest party guests. To make these you need. . .
Set of yarn darners (I found some at Walmart for under $2 for a set of 7) – they’re essentially a large-eyed needle – don’t skip buying these it’ll make threading so much easier!!! Cut the twine to the desired length, and start threading, then tie it off when you’re done! I packaged these in individual cellophane bags with a twist tie on top. Update March 6, 2012: My kids and I had fun making these on a playdate we hosted at our house. I opted to use regular fudge cookies (since the hole in the center is large and easier to string – without needles) and I’m happy to say that all the kids (ages 4 and up) were able to do these without assistance. Success! Forget my kids…I want a necklace with all those yummy treats on it:-) Ok, maybe for my kids too!!! Thanks for sharing on Trick or Treat Tuesdays. Brilliant! A toy and a snack in one for a long road trip! Thanks for your inspiration! We enjoyed this activity a TON! babysitting 4 little ones tomorrow…and they always HAVE to do crafts when they’re here. i think this will be perfect!!! 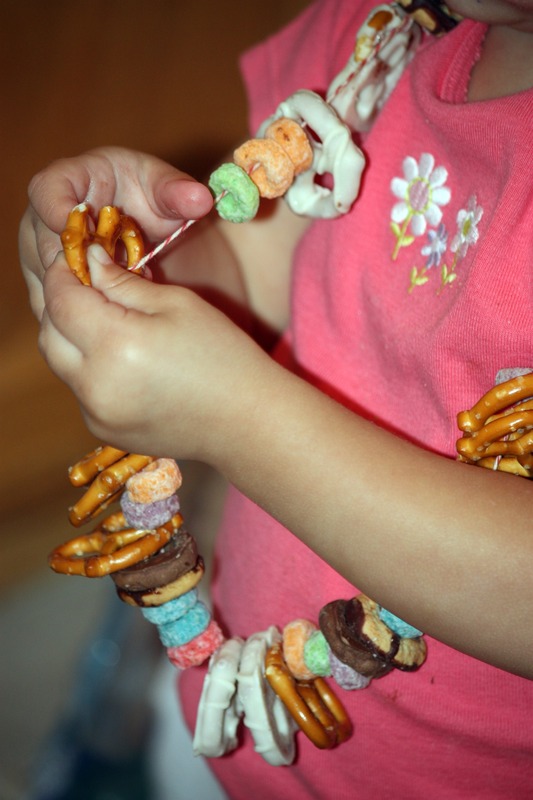 i mean come on…craft time and snack time in one?! thanks for sharing! Pingback: Friday Favorites « Living and loving, simply. You should use dental floss instead of twine! A Twofer! Where in Walmart is it?